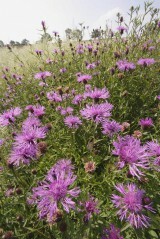 Also known as Black Knapweed or Hardheads. A common and familiar plant with thistle like flower heads but spineless leaves and stem. The flower heads, which are in bloom from June to September, are purple or occasionally white and exist in two forms, rayed (top picture on the left) and un-rayed (second picture down). Behind the flower is a hard head of overlapping bracts which sits upon the slightly swollen end of the stem. 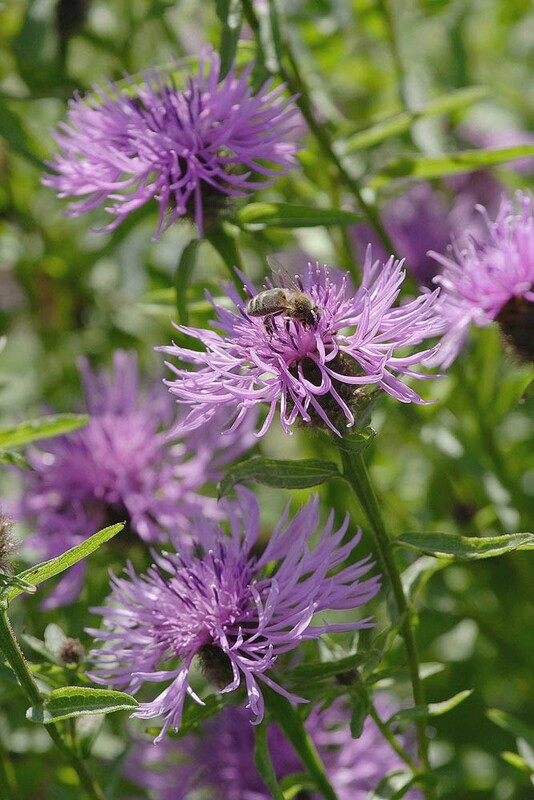 Greater knapweed, which is always rayed, can look a little like the rayed form of Common knapweed but can be told apart by the following features. In Common knapweed the bracts that make up the ‘hard head’ are pale brown with black/brown bristly edges. However the degree of overlap obscures most of the pale brown. In Greater knapweed these bracts are grey-green with black/brown bristly edges but, because there is less overlapping, much of the bract is still visible. 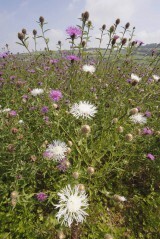 In Common knapweed the leaves of the upper stem are lanceolate and in Greater knapweed they are toothed. 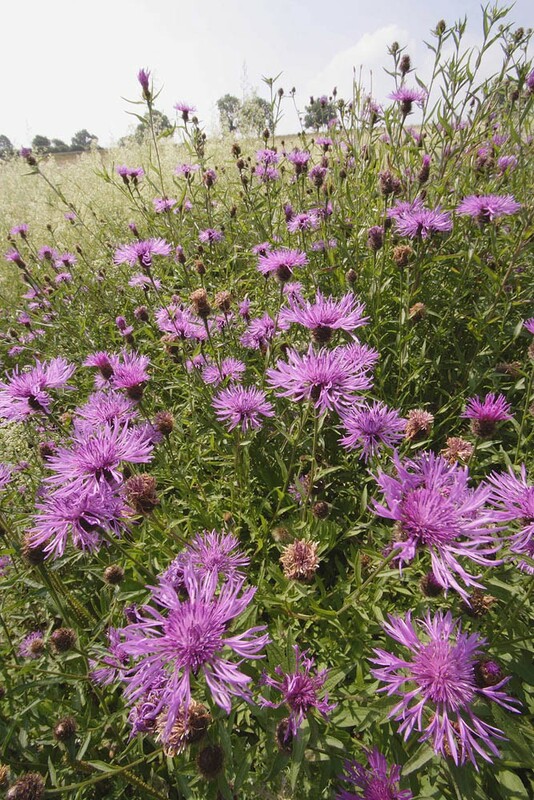 Common knapweed is a tall, native, grassland perennial of low to moderately fertile soils but is absent from very damp or acid sites. Habitats include meadows, pastures, road verges, field borders, waste ground, scrub land and woodland edges. 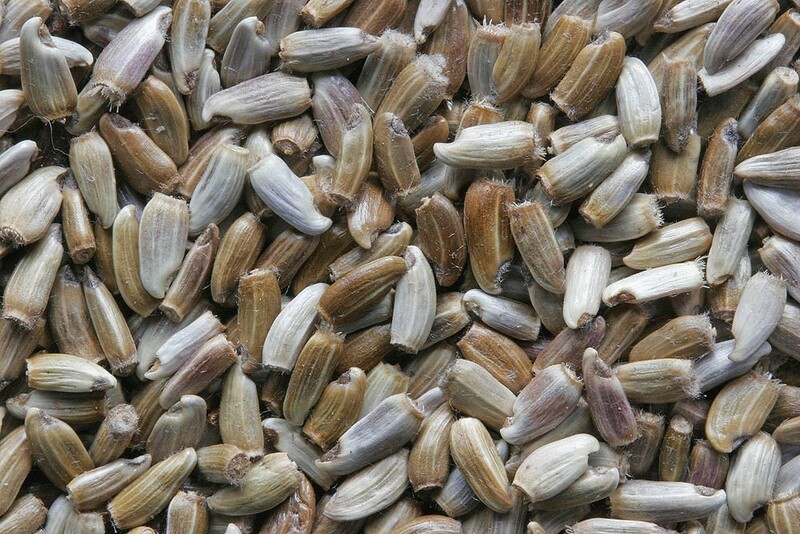 It can persist for many years in both grazed pasture and neglected tussocky grassland. However, in order to regenerate it needs an opportunity to set seed and for that seed to become established into open ground. Flowers are pollinated by a wide range of insects including bees, flies, butterflies and beetles and the resulting seed heads attract goldfinches and other seed feeding birds.